"The bankruptcy of the political ideas of the 20th century that were to be paid for in advance with human blood is one of the main reasons for creating Das Anatomische Theater. The only show is DADA, as an aggressive, nihilistic requiem for this failed society. 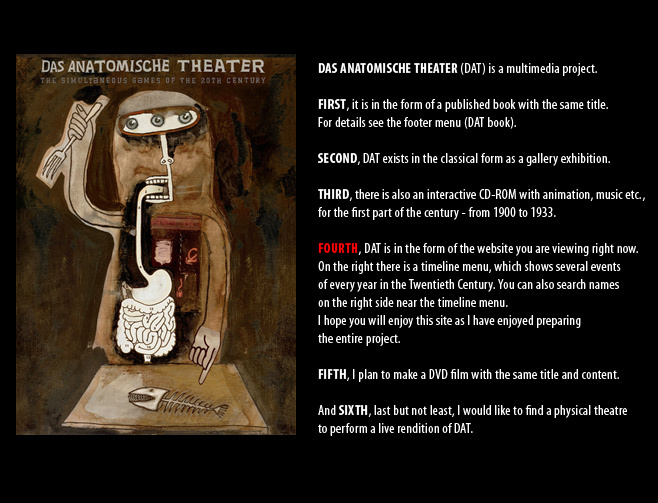 The Theater is anatomi-cal in its method because the 20th century is placed on a dissection table; the people, the events and the phenomena therefore do not wear cos-tumes or masks; on the contrary, even the skin is torn off, tissues are cut, bones are reached, and the muscular, nervous, blood and lymph systems are observed. The walls of the Theater remind us of the walls of a bio-logical lab surrounded by glass showcases filled with neatly arranged bot-tles in which, floating in 40% formaldehyde solution, the body parts of European history await their curious observer" (M. Krstić).